Packing Materials Save Your Belongings!The boxes, padding, and wrapping that you use to cushion and package your possessions during a move are very important. If you have never had the responsibility of preparing items, especially delicate or expensive pieces such as dishes and antique furniture, you should take some time to familiarize yourself with the different types of packing materials available and decide which ones you need. Having these materials on hand before you begin packing will help you avoid delays and ensure that all your belongings are protected according to your preferences. 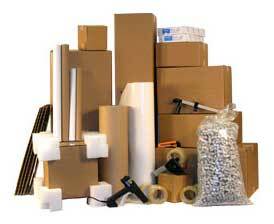 If your budget allows, you should use moving boxes specially designed for different household items. Wardrobe boxes allow clothing to hang inside; dish boxes have internal dividers and reinforced exteriors; book boxes are small and easily stacked; and picture boxes can be cut to the appropriate size to perfectly fit large framed prints or mirrors. Uniform boxes make loading a moving rental truck very easy, as they fit together well and reduce wasted space between boxes. The padding used most often is newspaper. While it is free and plenteous, newspaper can damage delicate items because it has a rough texture and ink that can rub off on other surfaces. If you are able to save or buy Styrofoam packing peanuts, bubble wrap, and plain movers’ paper, you can protect your most delicate treasures more thoroughly. Professional movers use cardboard panels to protect the feet of furniture, then wrap the entire piece in several layers of static cling wrap. While this wrap is quite expensive, it does a great job protecting wood from scratches and preventing upholstery from being torn during loading and unloading. Even if you do not use static wrap, you can tape cardboard from dismantled boxes over the corners of valuable pieces to avoid damage. Be sure to choose tape that is easy to cut and will remain firmly adhered to your boxes and wrapping throughout your move. In most cases, you get what you pay for in terms of quality! © 2019 MovingYourHouseNow. All rights reserved.